Harry Potter and the Chinese Knockoffs | hesaidwhatnow? Can you believe that it’s been seven years since the final book in the Harry Potter series was released? That fact not only makes me feel old, but also a little bit nostalgic for some more stories on the adventures of Harry and the gang. If only there were some more Harry Potter novels out there I could read. Thanks to China’s blatant disregard of international copyright laws, there is! 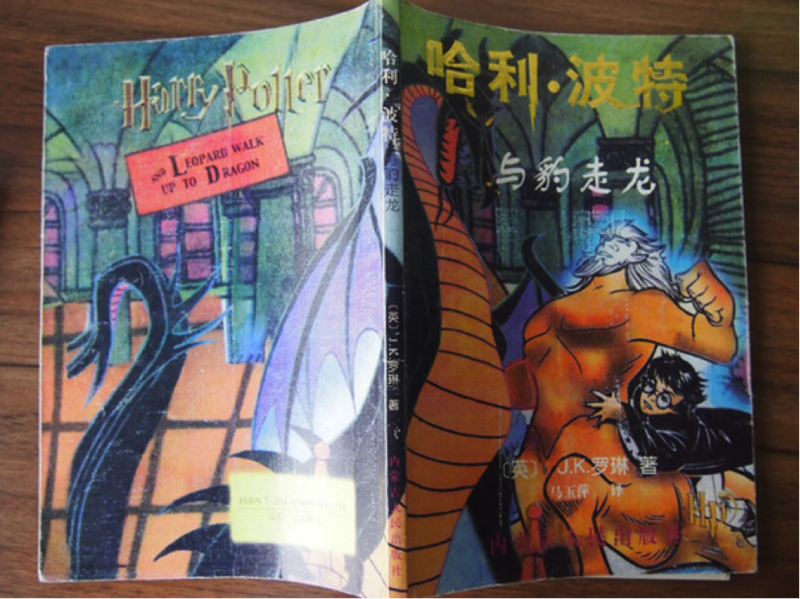 That’s right, over the years various dodgy Chinese publishers have released a whole bunch of knockoff Harry Potter books for the paying public to enjoy. If you like plagiarism, misplaced creativity, and hilarious translation errors, you’ll love these books even more than the originals! SPOILER ALERT: This post gives away plots to several Chinese Harry Potter knockoffs, but also the ACTUAL Harry Potter series. But seriously, if you haven’t read them already, there’s something wrong with you. And yes, these are honest to god books and their actual plots. There are many things to love about this knockoff besides the confusingly translated title. The cover is great, because not only is Harry riding a centaur, but that centaur is about to punch a dragon who looks suspiciously like Maleficent from Disney’s Sleeping Beauty. But if you open the cover and have a read, you’ll find a knockoff double play. That’s because Leopard Walk Up to Dragon not only rips off Harry Potter, but The Hobbit as well. Allow me to explain. It starts off enough like a Harry Potter tale – he goes from his usually summer stay at the Dudleys to Hogwarts where he meets up with Hermione and Ron. Then things get a little strange. An eerie voice announces that Harry’s nightmare is about to start, which lures them outside (which is probably the opposite of what you should do if a spooky, ethereal voice starts threatening you). Once outside they are caught in a rain that is bizarre even in the world of Hogwarts. Not only does it instantly soak the trio to the core, but it is sweet and sour, like so many of your favourite Chinese dishes. Even crazier than that, it transforms Harry into a hairy dwarf and transports him to Middle Earth for an epic cross over! From there, it is essentially The Hobbit, only with the names changed to the names of Harry and his friends. The only Hobbit character who isn’t appropriated as a Potter character is Gandalf, who remains Gandalf. This might be the most confusing part of the whole story, as if ever a character could be easily converted to J.K. Rowling’s world, it would be the kindly, bearded, old mentor who is also the most powerful wizard going around. At least call him Ganbledore. What a catchy title! So pithy and exciting. And I’m glad that, to avoid any confusion, it points out that Chinese kids studying in Britain are from overseas. In this one, Dumbledore grows fearful when he discovers the threat of the Black Monster who, with a name like that, has no option other than to be evil. Dumbledore knows that as a pathetic Westerner, he is no match for such an opponent, and reaches out to Nine Mysteries – the Chinese equivalent of Hogwarts – for assistance. They send over six students, who amaze the pathetic students of Hogwarts with their mysterious magical arts and transform the lives of Harry and his friends. Thanks to the sheer awesomeness of the Chinese students, not only do Harry, Hermione and Ron muster up the courage to face Voldemort, but Draco frees himself from the shadow of his family. All seems well, until the magical protections of Hogwarts fail and Voldemort attacks, bringing with him Death Eaters, werewolves, dementors, and giants. Can Harry and the gang defeat them? Of course they can! They now have six Chinese students to help! This sounds like the most pro-Chinese propaganda story of the lot, and I’m a little disappointed we didn’t hear more about the Black Monster. Is it just me, or does Harry look normal, normal, normal, shoes? Harry Potter and Leopard Walk Up to Dragon must have been a success, because in Waterproof Pearl Gandalf is back! Along with some champ named Peter and the ‘little warriors’, Harry and Gandalf find a sea city in the desert through a magic keyhole. There’s every chance that the little warriors are hobbits, or dwarves, or some other Tolkien creation, but whoever they are, Harry and the crew get gold armour and kill the head of the monsters. However, when they return to Hogwarts, they discover that Hermione has been kidnapped by the Dragon King, and only one thing can save her: the waterproof pearl, an item that must be incredibly powerful, because unlike every other pearl that has ever existed, it is waterproof! Harry finds the pearl, defeats the Dragon King and rescues Hermione. I’m not sure what happens after that, but I’m guessing Gandalf steps out into a soy sauce rain so he can be transported to Middle Earth. 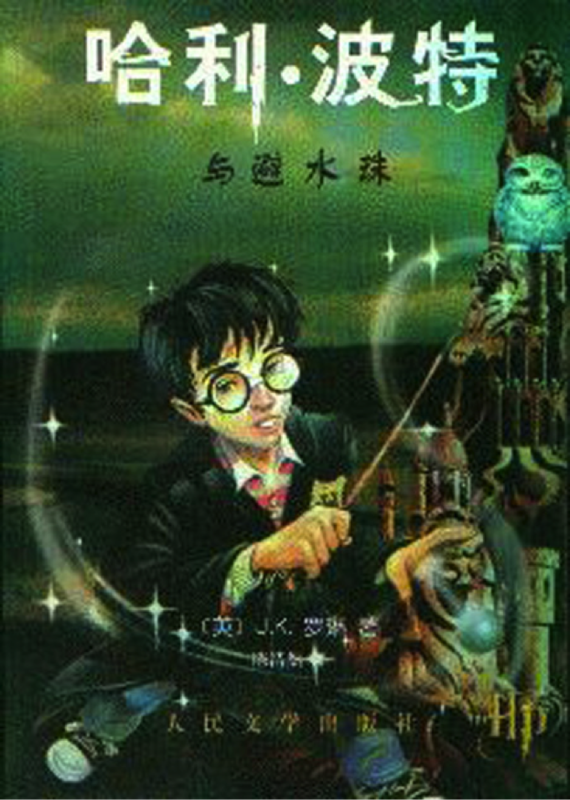 The isn’t much info out there on the plot of this one, other than the story takes place at Hogwarts and involves Harry and his friends, various characters from Chinese literature, and cut and pastes text from – no surprises – Lord of the Rings, as well as from multiple martial arts epics. In my mind the story involves at least one kung fu fight between Saruman and Neville Longbottom.